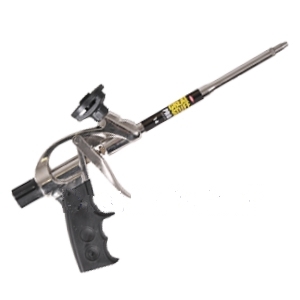 PRODUCT: Dow #230409 PRO-14, 7.75 inch Barrel, Professional / Contractor-Grade Foam Dispensing Gun. Lightweight Aluminum Body. For use with Dow Great Stuff, Enerfoam and others. Includes replaceable Smooth Needle Nose Tip. Price/Gun. DESCRIPTION: The PRO-14 enables pin-point control for all Great Stuff Pro sealing foams. Gun tips allow attachment of straw for hard to reach places. Professional grade quality tool for use with all Great Stuff Foams. Versi-Tite Gun Cleaning Solvent. 16 oz. can. Price/Can. (UPS Ground or Truck Shipment only; used with Versi-Tite dispensing guns, and similar ones). Versi-Tite VT-GUN Dispensing Gun, Professional Grade. Price/Gun.